I debut a new feature this week at Movie Mezzanine that elaborates on the use of color in a film in establishing mood, character, narrative, themes, and the like. The feature will be called Palette Cleansers, because puns. Anyway, our first selection is Jacques Tourneur's superb, somewhat neglected Canyon Passage, his first Western and first color film. The film has many qualities worthy of recommendation, from its sparse storytelling that belies a dense plot of character relationships and racial politics to the terrific performances it gets from its cast (especially Dana Andrews, who gives one of his finest here). What stands out most, though, is Tourneur's use of color, every bit as subtle but showy as his shadow work and capable of deftly delineating the multiple leaps in perspective and POV. The handful of stills featured are only a fraction of the aesthetically beautiful but meaningful shots in the film. Yossi starts so powerfully that the frustratingly stiff, unvarying approach of its camera makes the eventual slog all the more disappointing. In reconnecting with the older, flabbier and unhappier protagonist of his Yossi & Jagger, Fox instantly establishes a sense of quiet agony through his lead's soft expressions and hollowed eyes. But as Yossi inches toward self-liberation, the camera telegraphs his eventual retreats, robbing moments of suspense and, more importantly, the emotional connection of this man's dreams of acceptance and honesty of self. Apologies for the lateness of this post, but last Friday's Netflix picks can be found at Movie Mezzanine. For this installment, I promote the birthday of one of the great American independents, the densest work of another, and a crackerjack new French thriller that made my honorable mentions for 2012. My full post is up at Movie Mezzanine. This is my unforgivably late Blind Spots entry for last November. December's pick, Feuillade's Judex, will likely not receive a write-up until next month. However, this month's scheduled Blind Spots piece will appear on time. 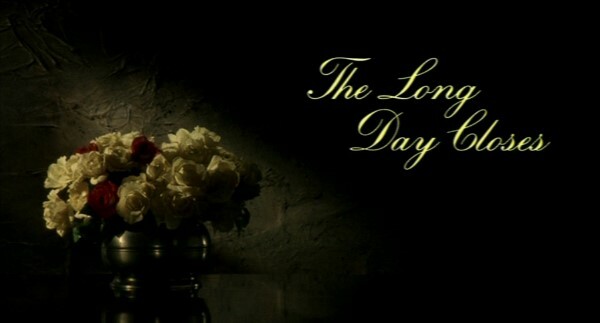 The Long Day Closes opens like a classic movie, with the credits appearing before the picture instead of after and playing over a styled image. In this case, it is a still life of some flowers off to the left as credits appear in flowing cursive in the right two-thirds of the screen. When the movie proper begins, it is to the 20th Century Fox fanfare blared over a brick wall with a plaque announcing the film’s setting on Kensington Street. The juxtaposition deftly pre-summarizes the film, in which the still life recreations of postwar Liverpool are enlivened by the joys of cinema that not only give its child protagonist some kind of escape in a dreary community but are internalized and re-emitted to make that world livable. The boy in question is Bud, an unassuming chap whom Davies regularly places directly in the center of the frame, surrounding him with symmetrical arrangements of people and objects. The dank, dirty brick walls of this industrial port town lend the film shades of neo-realism, but as with the more brutally forthright Distant Voices, Still Lives, such mise-en-scène adds a lyrical, formal quality to what might have been kitchen-sink aesthetics. The falsity of the image is blatant, but that also informs so much of the film’s deeply felt approach to memory. I watched Don Hertzfeldt's masterpiece and Hideaki Anno's nihilistic OAV within days of each other, and I could not help but be drawn by each. Not simply for their respective demonstrations of avant-garde, uncompromising animation, but for the cosmic sense imparted through mental illness in each. They are great films, among the greatest works of modern animation, and I jumped at the chance to write more about either. For this week's Shelf Life piece at Movie Mezzanine, I took a look at the Takashi Miike film that, more than the few others I've seen, makes me want to really explore his vast filmography. A stylish but muted yakuza thriller, Graveyard of Honor leaves the criminal element choking equally on its own blood and hypocrisy as they bring into their fold someone who shows just how absurd their codes of honor really are. One of the best gangster films ever. My full piece is up now. I knew I'd forgotten to link to something this week. Last Monday, my second Something Old, Something New piece went up, this time on the similarities that link Lincoln with another subversive, empathetic portrait of an abstracted icon, The Last Temptation of Christ. I'm quite happy with this piece, so I hope you read it. It can be found at Movie Mezzanine here. I've been reading the blog Rupert Pupkin Speaks for a while now, and I was delighted when its operator, Brian Saur, sent a request for me to submit my favorite older films seen for the first time in 2012. I was actually planning a list like that for this site, so I needed little incentive to participate. I apologize for the briefness of some of my thoughts, but I submitted this list at the height of year-end madness and was just about burned out from blurbs. Nevertheless, I was happy to share the older movies that made the biggest impact on me last year. In fact, I might start doing monthly pieces here for what has grabbed my attention. My full list is up here. It's that time of week again, where Corey Atad and I pick our favorite offerings on Netflix Instant. My own picks for the week are an Oscar-nominated documentary, the theatrical debut of one of our greatest modern directors, and one of the best and most influential TV series of the last two decades. Check 'em out over at Movie Mezzanine. I got an early surprise this year with a festival holdover from Sheldon Candis, the remarkable, intimate drama Luv. Tracking a prepubescent boy's harrowing journey of maturation, Luv announces itself quickly by dissipating a magic realist opening for the hard realities of Baltimore, and from there he crafts an affecting look at how violence traps men (in this case, specifically African-American men) in a perpetual drive to prove one's masculinity. As I say in my full review, you could almost run it with Cronenberg's A History of Violence. Over the weekend, I started a new column on Movie Mezzanine that picks a film a week for review, and my first selection was Robert Siodmak's dreamy noir Phantom Lady. Better, in my humble opinion, than Siodmak's later The Killers, Phantom Lady pushes Siodmak's use of shadow beyond the usual moral shadings of the genre and into an outright nightmare, where figures appear and disappear and a woman's quest to clear the name of the man she loves is gradually suggested to be the framework for what got him in trouble in the first place. Even its Hollywood ending takes on perverse, oneiric overtones, caught in a literal loop as the smiling face that closes the film starts to look leery rather than elated. The Tower starts off agreeably enough, with shots of geometrically aligned staffers in an ostentatious but cheaply made high-rise apartment complex demonstrating that even the lowly workers are not allowed to be a hair out of place for the elite who will occupy the buildings. Once it turns into a disaster movie, however, The Tower loses much of its endearing character and begins to feel like a standard, American effects reel. This is shaping up to be a year in which some West-friendly Korean talent takes Hollywood by storm, yet movies like The Tower show how Hollywood's influence back on one of the most vital areas of contemporary world cinema may be a draining influence. This week's Netflix picks are up at Movie Mezzanine. This week, I single out the unexpectedly rewarding fourth installment of an uneven spy-action franchise, the film that brought Ryan Gosling to my attention, and a stellar, heady comeback from Monte Hellman. The full post (along with Corey Atad's Canadian Netflix choices) is up at Movie Mezzanine. I have no sensitivity to seeing the South depicted as a caricature, but the caricature in The Baytown Outlaws is so thin I kept wishing Billy Bob Thornton's drug lord would break character so the actor (also the scribe of several great films set in and tied to the South, most notably One False Move) could go behind the camera, do extensive rewrites, and start from the top. But then, who could be mad a film for failing to capture its milieu when it so quickly moves into a Road Warrior-esque travesty? Better to attack that plot development for its poor direction, lifeless action and insipid humor. Baytown slipped quietly through some festivals for a modest limited release, and it will be forgotten as quickly as it passed under everyone's radar. I debuted a new weekly feature this morning at Movie Mezzanine called Something Old, Something New. In it, I take a film released within the last few years (and even more recent once the year gets underway some more and I have more to choose from than January offerings) and make it a double-feature of sorts with an older movie. My first post links Jacob Krupnick's infectious city symphony Girl Walk//All Day, with one of the first such movies New York received, Paul Fejos' sound-silent hybrid Lonesome. The two link up in a variety of ways, and I look forward to building out this feature. My post is up at Movie Mezzanine. Overtime starts as a vague Tarantino homage before turning into a silly pastiche of various clichés over the course of its 80 minutes. Ultra-low-budget, the movie has all the usual issues of a homemade film: bad sound, stiff acting and nonexistent effects. And yet, I kind of liked it; the movie is so off the wall ridiculous in its bounce from half-baked idea to half-baked idea that if it never adds up to more than (or even equal to) the sum of its parts, at least it has parts to be added. To go with my favorite Criterions of the year, I put up my favorite Blu-Rays of the year over at Movie Mezzanine. Check 'em out. Every week at Movie Mezzanine, Corey Atad and I pick three movies on Netflix Instant (me for the US, Corey for Canada). These posts will go up every Friday and include a newly added film, one set to expire, and then one we just want to highlight. Our first post can be found here. All I gotta say is, when I get around to Elephant this year, it better undo a lot of the damage of Van Sant's last decade. I still haven't seen his largely ignored 2011 effort Restless, but it cannot possibly be worse than Promised Land, a smug liberal tract about going green financed in part by oil. For a brief time, it almost works, setting up the arrogant, manipulative natural gas company rep with an equally officious and pushy environmentalist, until a twist derails its vague hints of intelligence to set up a truly embarrassing, back-patting speech that may be the worst monologue of last year. Heinous. Up at Movie Mezzanine, I've put up a list of my 10 favorite Criterion releases from the past year. It was a bit of an off year for the company, but it still put out some of my favorite movies and introduced me to some stunning new discoveries. So head on over and check out my article. This morning, Sam Fragoso of Duke and the Movies launched his new website, Movie Mezzanine. I'm proud to say that I will be serving as senior editor and the head of the site's DVD/streaming section. Sam is a great guy with a lot of passion, and the team he assembled is superb. Many of my favorite bloggers are taking part, and I cannot wait to really get underway with this incredible staff. We've hit the ground running with some year-end reviews, including a staff feature of our aggregated picks for the best of the year. Check it out to see our picks and blurbs (I cover Bernie, The Color Wheel, The Day He Arrives, This Is Not a Film and Moonrise Kingdom), and take a look at our individual ballots here (note: mine is slightly different from the one I put on this site because I removed undistributed titles). My activity on this blog may drop in the future as I devote more time to Movie Mezzanine, but a lot of what I will put there would likely have gone here anyway. I will update this blog with any exclusive content, as well as any links to new articles elsewhere. So set your bookmarks for this exciting new site, and I'll see you there!